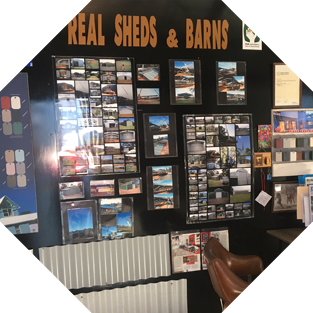 Real Sheds and Barns consist of Craig, Michelle and Haidyn And Cienna. We specialize in Barns, Farm Sheds, Garages, and Carports. We are professional, reliable, efficient and we provide very personalized service. We have 25 years experience in the construction of sheds. We distribute Safety Steel Structure kits which we believe are of the highest quality. sample of the customers satisfied with the quality service he provides. 'We couldn't be happier with the whole experiance. The peronal service was professional and we especially loved the Permit Assistance that was provided!!! I was extremely happy with the service and would have no hesitation reccommending Real Sheds & Barns to future clients!!!! a sample of the customers satisfied with the quality service he provides. We specialize in Barns, Farm Sheds, Garages, and Carports. form to send us an E-mail. We will quickly address your needs and respond in a timely manner.